Cuddle up by the fire place in the Great Room, enjoy a good book, use the birding software on the computer, or watch the birds at the feeders right outside the windows. Casa de San Pedro has a central courtyard with fountain and flowers (and birds and butterflies!). 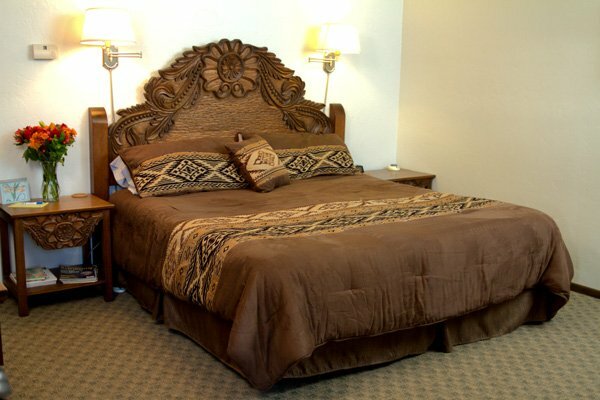 All Guest Rooms surround the courtyard and feature hand carved Mexican furniture, each with a private bath, and each offers either a king size bed or two double beds. 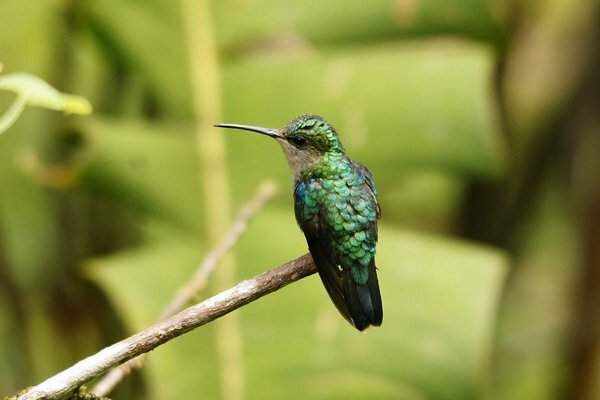 Each room is entered from a covered patio where guests can relax in an authentic Mexican patio set and enjoy the fountain and the vegetation that has been selected to attract hummingbirds into the courtyard. All rooms are air conditioned with individual controls for your personal comfort. High speed internet access is also available via WiFi or with the guest computer (and printer) in the Great Room. Guests are also welcome to use the house telephone on the desk in the Foyer for calls to local or US wide numbers. Generally cell phones using the Verizon network work best inside the Casa, and Sprint or ATT (who have more limited cell coverage in the area) may work better outside of the inn. Fragrant shade grown coffees and herbal teas greet you each morning in our Dining Room, where you will be served a full gourmet breakfast, with fresh baked goods, casa entrées, fruit, juice, and coffee or tea. (We will be happy to accommodate your special dietary requirements. Please let us know about your needs when you check-in). The breakfast gathering provides a unique opportunity to meet other guests, get tips on local hikes, where to find the best wildlife habitats or gain information on the area and its rich history. Casa de San Pedro also provides afternoon home baked pies, snacks and assorted beverages. Stroll the seven cycle labyrinth in our front gardens. The labyrinth is a meditative journey which centers your thoughts and relaxes you. It is set amid the scenic mountain ranges and the treed river course that make our valley so spectacular. Each turn of the labyrinth provides you with incredible views of these stunning mountains and the magic setting which the Casa has claimed as its own. The Great Room provides an opportunity to read, complete a diary, plan your next hike, update your bird list to include several new “life birds,” research birds on the computer or just relax by the fireplace. You may prefer to just look out the large windows and enjoy the beauty of the purple mountains which surround the inn in all directions. 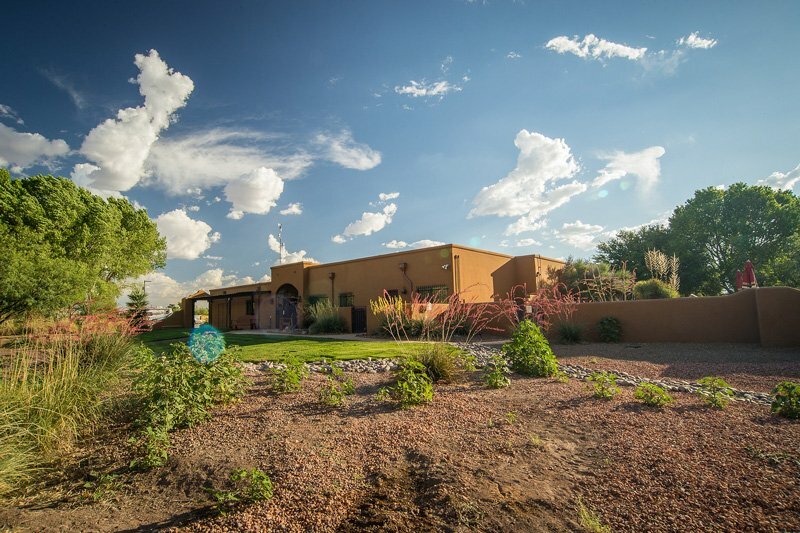 Perfect for the beautiful Arizona weather, Casa de San Pedro has a Ramada with a gas barbecue which guests are welcome to use for relaxing dinners under the stars. A Gift Shop has many nature-related and unique gift items for friends or a memento of your trip. Selected birding, hiking and personal accessories are also available. The inn is designed as an excellent retreat for management planning teams, business and professional groups, clubs, organizations and reunions. We Support naturalist educational and conservation projects for the San Pedro River and the many birding areas that you will want to visit. We have installed a solar panel array (105 panels!) to generate most of the electric power we use throughout the year. This is a significant investment in our future and another example of our commitment to our environment. Updated high efficiency air conditioning, heat and control systems. By investing in these systems we have reduced energy consumption by over a third. Water conserving shower heads, and guest room amenities including hair dryers in each room plus other convenience items. Landscaping and drip water irrigation systems – cutting water usage for plant irrigation by 80%. We are continually doing new things to show our support for preserving natural resources and precious natural habitats both locally and globally. We sponsor San Pedro River Clean-up BBQs for neighbors & friends to help the BLM in picking up trash along the San Pedro River.